Hey y'all, I'm selling my Sherpa cause I'm moving across the country and need to lighten the load! 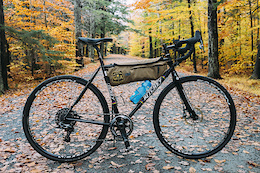 I bought it new 2 months ago an used it to bikepack 400 miles of the Southern Highlands Traverse from Asheville, NC to Elijay, GA and it was wonderful. That route hits almost all of the most technical and challenging trails in the southeast and this bike ate them up while fully loaded. Unloaded, its still super comfy, but mostly just wants to play on all the extra credit features on a trail. It also feels surprisingly plush. The plus tires help with that, but still.. I rode Snake Creek in north GA, (famous for being almost completely bumpy, rocky, techy, gnar), and it never felt out of its depth nor did I wish for more travel. So.. if you're looking for something to do those mostly singletrack bikepacking trips where the going gets rough, as well as having a bike thats a blast unloaded.. then buy this one! Changes i've made to the bike are as follows: Swapped the stem to a shorter 60mm Truvativ AKA. Bars: Wider 760mm Giant alloy (not sure which model) Seatpost: Thompson Elite Dropper. Saddle: WTB Silverado Team w/ Ti Rails Tires: Maxxis Rekon 2.8's, Plenty of life left in them. Bike will come with a Revelate full sus frame bag. There is some cable rub on the frame and bag rub on the fork crown. Other than that the bike is near perfect condition.